“This is Money” reports that Heathrow would demand compensation of between £11 billion and £18 billion if it was forced to close because a new hub airport was built elsewhere.They say executive sources said it would seek to recoup the net asset value of Heathrow, plus a premium for compulsory closure. Heathrow is 40% owned by the Chinese, Qatari and Singaporean governments and 34% by Ferrovial. BA would also expect compensation for the investment it has put into the airport, it is believed. Willie Walsh has said BA would move to an alternative site only if Heathrow were closed. The prospect of huge compensation bills on top of the £80 billion needed to build a new four-runway hub airport in the Thames estuary would make the cost prohibitive. BA and other airlines have insisted that they would stay at Heathrow if they had a choice. They also say linking Heathrow to either Gatwick or Stansted would not work. And love the 4 runway idea. Heathrow would demand compensation of between £11billion and £18billion if it was forced to close because a new hub airport was built elsewhere. Executive sources said it would seek to recoup the net asset value of Heathrow, plus a premium for compulsory closure. 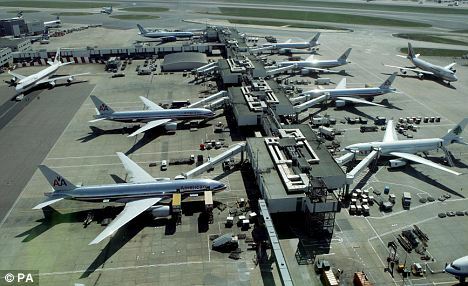 Heathrow is 40 per cent owned by the Chinese, Qatari and Singaporean governments and 34 per cent owned by its original owner, the Spanish group, Ferrovial. British Airways would also expect compensation for the investment it has put into the airport, it is believed. Chief executive Willie Walsh said BA would move to an alternative site only if Heathrow were closed. The prospect of huge compensation bills on top of the £80 billion needed to build a new four-runway hub airport close to London would make the cost prohibitive. There is growing consensus among airlines and Heathrow – the new name for owner BAA – that only a new airport or a massively expanded Heathrow would work as an alternative hub. City heavyweight Sir Howard Davies is to head a Government commission to investigate Britain’s capacity crunch and consider the building of a four-runway megahub. BA and other airlines have insisted that they would stay at Heathrow if they had a choice and linking it to Gatwick or Stansted airports would not work, unless Heathrow were closed and its airline customers forced to move elsewhere. Heathrow senior management is aware of this, which helps to explain the company’s new enthusiasm for the Davies commission. Until now Heathrow’s policy has been to stop Government opposition to a third runway. But last week the airport operator called on the Davies commission to consider reports by the Free Enterprise Group of Conservative MPs and the Policy Exchange. Britain is beginning to suffer long delays because Heathrow is full and losing valuable business abroad. Posted: Sunday, November 11th, 2012. Filed in General News, News about Airports, Recent News.